In this new series called “Now I know my Wine-phabet”, I will explore letter by letter wine and what I believe are some of the most important and/or influential aspects in the world of wine. Since I am only choosing one topic per letter, many will be missed. Hopefully these posts come across as being whimsical and informative. K-ounterfeiting and fraud sums up Rudy Kurniawan. Rudy Kurniawan has left a bad taste in mouths of wine collectors. Today there are hundreds of collectors rummaging through their cellars wondering if they have K-ounterfeits or the real deal. Rudy Kurniawan was arrested in March of 2012 for producing fraudulent bottles of the worlds most expensive and allocated wines. He sold these wines to auction houses and made millions. But in the end all bad guys go to jail. He was out smarted by guys who really knew their stuff. David Molyneux-Berry of the Sotheby, Domaine Ponsot and others came to save the day. 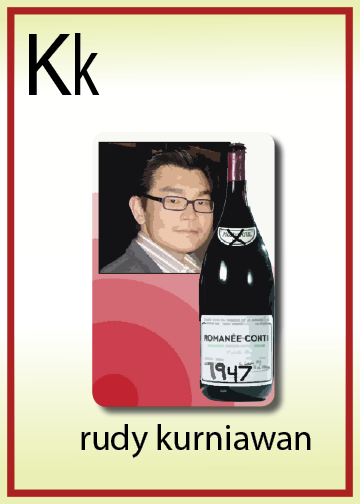 They accused Rudy Kurniawan of k-ounterfeiting wines that were never even produced. Today, Rudy Kurniawan has left the wine world dumbfounded and constantly watching its back. Everyone is suspicious of their cellars. I am sure that the city that never sleeps, Las Vegas, is wide awake! Somms and wine directors are crossing their fingers, hoping that those Petrus bottles they bought from private cellars are real. Chances are…hmmm…I don’t want to say.